This native tree has the largest edible fruit native to the U.S. Pawpaw (Asimina triloba) known as “wild banana,” or “prairie banana,” derives its name from the Spanish, “Papaya.” It has almost no insect or disease pests. An endangered species in New Jersey (threatened in New York), it is native to the East, South and Midwest. First mentioned by the Spaniard deSoto while on expedition, he found Native Americans growing it in the East. It was a favorite dessert of George Washington, and Thomas Jefferson planted it at Monticello and shipped seeds to France. 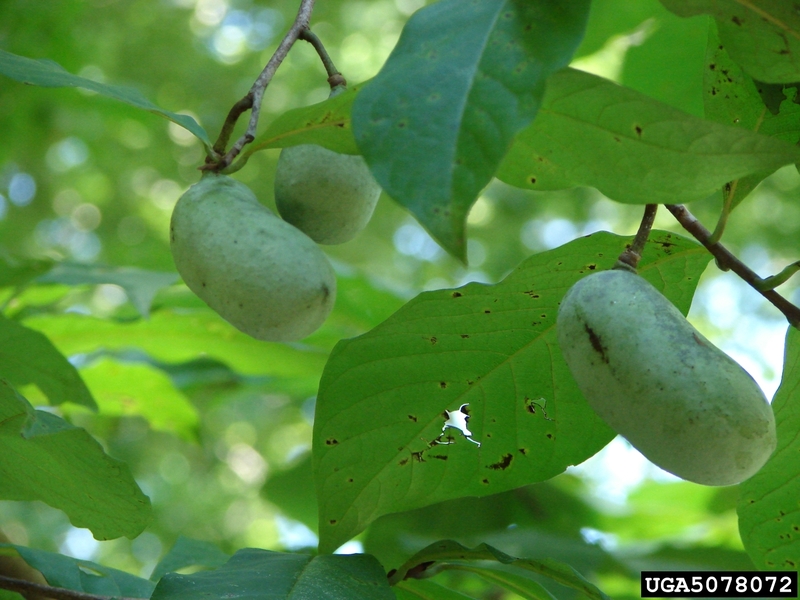 Pawpaw has a pale, custard-like fruit with spoonable flesh and easily removed black seeds. Usually eaten raw and chilled, it tastes similar to a mixture of banana, mango, cantaloupe and cherimoya. High in antioxidants and fatty acids, it is supposed to have more nutrient value than apples and peaches, and more protein than bananas, apples and oranges. Once picked the fruit spoils quickly, so it does not ship well and is usually found only at farmer’s markets. It is also used in ice cream, pancakes and juices. It is especially revered in Southeastern Ohio. The fruit, with colors from yellow-green to brown, matures from mid-August to October and is up to 2-6” long and 1-3” wide. It is eaten by raccoons, foxes, opossums and squirrels, but seldom by deer or rabbits. Pawpaw is not self-pollinating. Growers often use a brush to pollinate the flowers to ensure a good crop, or spray them with something smelly, like fish emulsion, to attract pollinating insects. The leaves, twigs and bark have a disagreeable odor and contain a natural insecticide, “acetogenin,” which probably contributes to the pollination difficulties. The larvae of the native Zebra Swallowtail butterfly ( dark, striped caterpillars), eat Pawpaw leaves as their only food. Pawpaw’s alternate leaves, which are among the last to appear in the spring, cluster symmetrically at the ends of branches. The delicate leaves are 10-12” long and 4-5” wide, dark green above and lighter below, and prefer non-windy areas. The flowers are 1-2” across, bloom in March through May, with colors ranging from red to purple to maroon. The tree, which prefers full sun after the first few years, grows naturally in patches, spreading mainly by root suckers as an understory tree in well drained, fertile and shady bottomlands or floodplains.